Cold. This should be first feeling, when her back touched the snow. But all her thoughts and concentration was focused elsewhere. Freezing was not important right now. When she opened the door, there was a figure with red red eyes there. She was so scared, that she jumped back, stumbled and fell down on the ground. Entrance door were leading to house, where Lana lived for two years in rented apartment. Messages appeared several times in news, informing, that there are monsters raging in the west, which has the world not heard before. Vampires, werewolves and god knows, what else.. But she never would have imagined, that she can meet it here, in Russia. In the winter land, so far away from all those places in the messages. Yes, Russia was told to be their original birthplace, but everybody said, they fled from the frost.. Yet there it was..
She was shaking on the ground, but it was not from cold. The door closed and the frightening figure disappeared. But she kept trembling and fear did not disappear. What will I do now?, Lana thought. cannot go home. And what about her cat? She must find help. Someone, who will help her get that monster out of the house. She stood up on shaky legs and went down the street to seek help. Would you like to help her? Don’t even try, Lana is just another food..
Nightfall. When darkness falls, monsters come out from their hiding places and look for food. You can be at the forefront of one of their clans and hunt people. Fresh food always tastes best. But you must also fulfill your desire for power and conquest of new territories. And because the West fell, you eyes turn east, into the cold and frosty areas in the of Europe. Ukraine? Appetizer. Russia promises a proper feast! 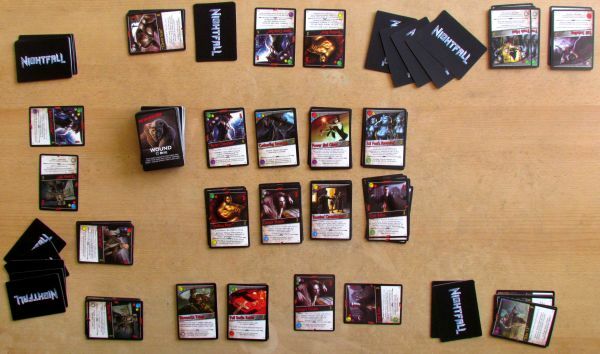 Nightfall (review) is a card game and we know its author David Gregg very well now. 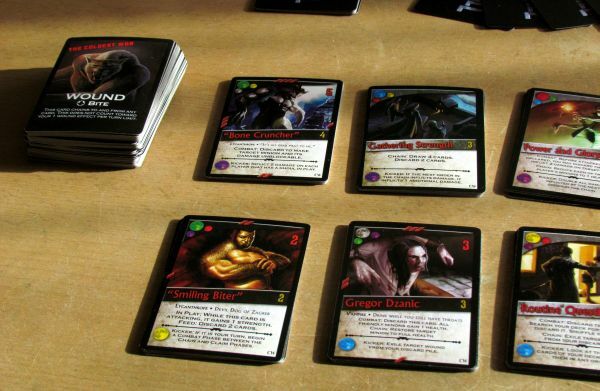 Players in this game compete against each other in a continual struggle between vampires, werewolves and ghouls. It does not matter, who you are or who you prefer, because your team can have all sorts of monsters of all races, if you can tame them to serve you. 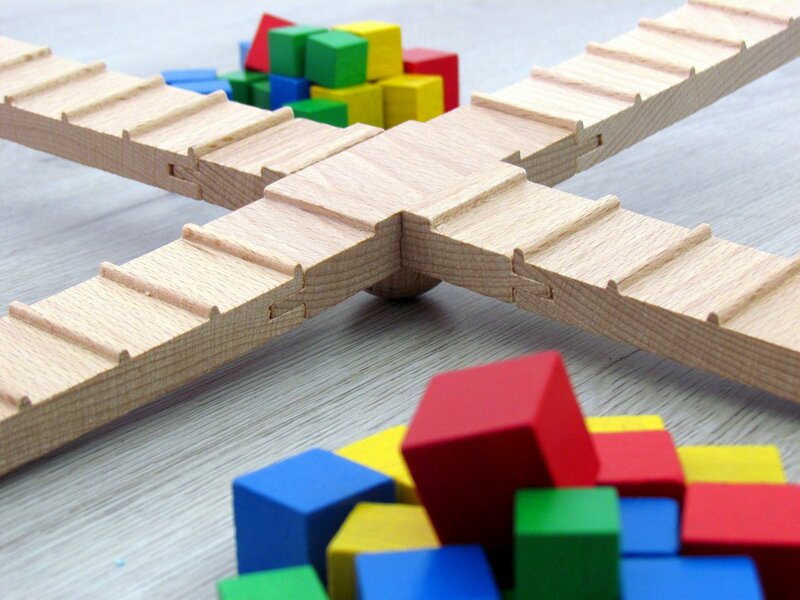 But the important thing is, whether you are able to put together a unit, which will work perfectly. Deckbuilding fits this task perfectly. You buy cards from a common stock for influence. Nightfall brought private archives to this principle. This is a location, where you have your own cards, which others have no access to, and they are only yours. Other characters and actions are common and whoever buys it, he will get help from its capabilities. In each round you have to attack the opponent, which is the basis of true Nightfall game impression. 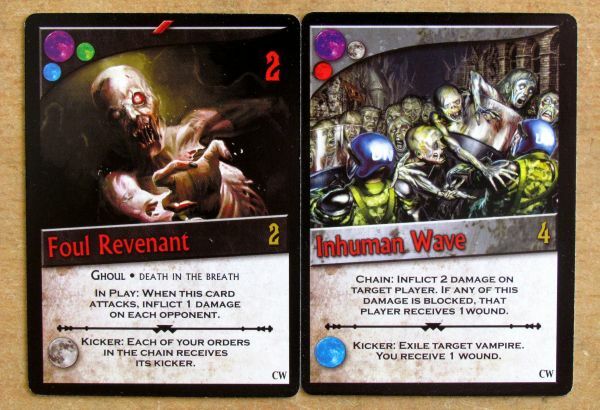 Characters have more lives, you rotate cards to note that and these servats defend their master (= you) against attacks. And how to use all those cards? With the help of new idea called “a chain”. In one chain, you can play more cards, when you succeed to connect them via moon color icons in their upper left corner. If any action penetrates your servant defense, a player takes damage into his deck. You cannot easily get rid of those wounds. Who has the most injuries in the end, is the loser. 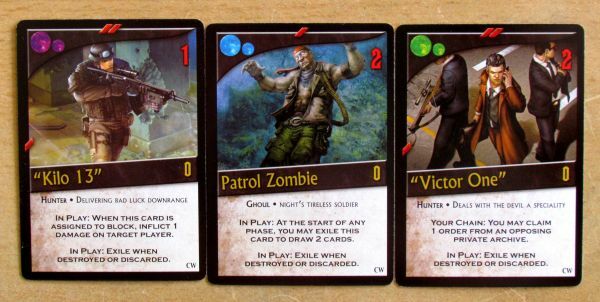 Nightfall: The Coldest War is an expansion, which attacked all players in 2012 and is the third expansion in a row – it comes right after Blood Country and Martial Law. 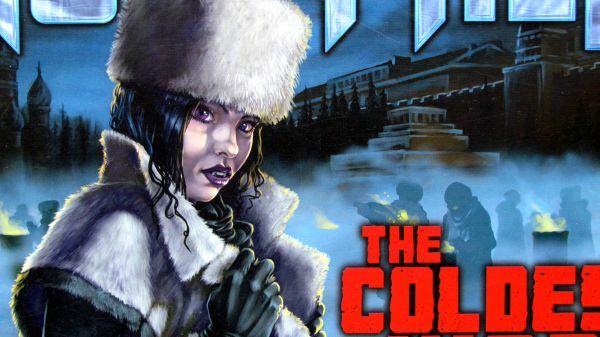 Just like Martial Law, also Coldest War is a full game and you do not need basic game to play it! Box contains everything you might need to play and so much more! 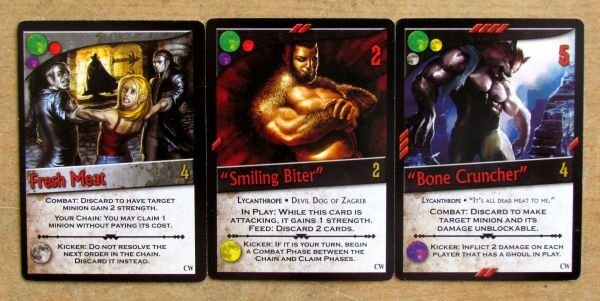 Cards are still illustrated by guys from previous boxes: Conceptopolis, James Hall, Andrew Hepworth, Jake Murray and Matthew Starbuck. 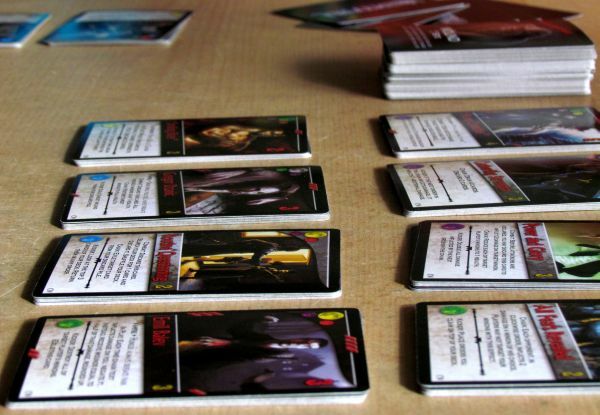 The game was published by Alderac Entertainment Group, abbreviated to AEG. 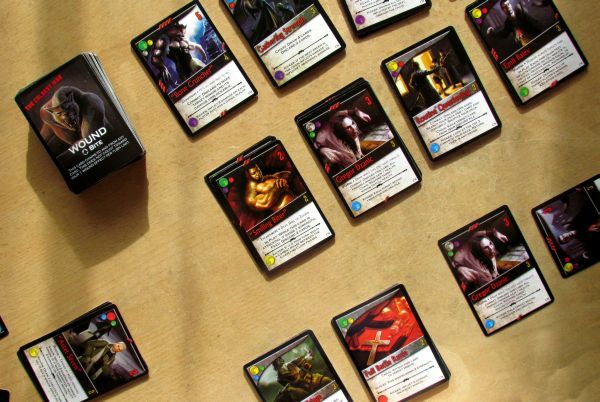 You can read another review from this publisher, for example adventurous Thunderstone: Advance (review) or the great Ninja: Legend of the Scorpion Clan (review). 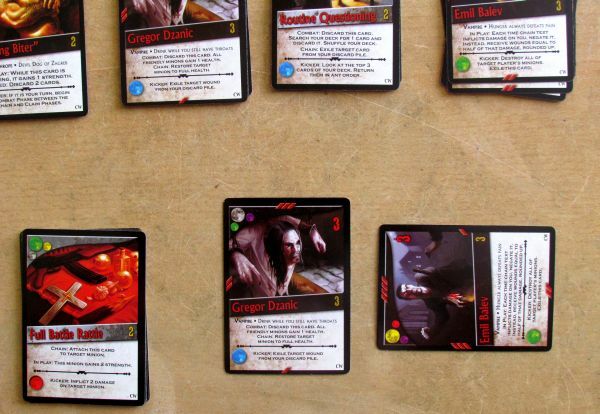 Already at the beginning of evaluation of this expansion, please note that all our players love the basic Nightfall and we were excited already about the addition of a small expansion called Nightfall: Dark Rages (review). That box brought personalization in the form of avatars, and of course plenty of other cards. The term “small expansion” is not quite in place, although it primarily refers to the dimensions of the box. Our task today is primarily to evaluate, what Coldest War brings new to enrich the game and if it can be useful to buy as an entry point into the world of Nightfall. Nightfall: The Coldest War can be found in usual regular big box of elongated shape, which we know from the basic version of the game. Inside, there is more than three hundred cards hiding, offering great entertainment. And all of them are completely new. 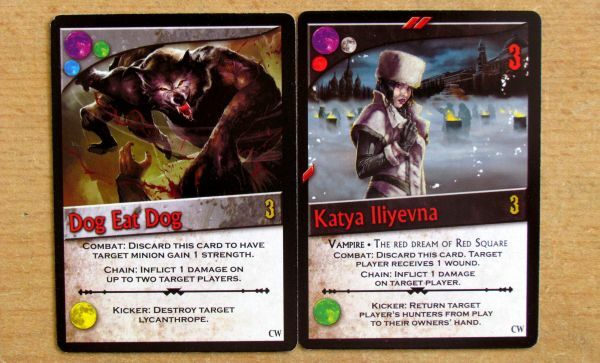 Despite Coldest War being playable independently, all cards are different from those, which you already know. How is that possible? You will see. In the first place, 228 cards are intended purely for gaming. And because each of them is available only in seven specimens, you will find twelve action cards and twelve new characters in the box. 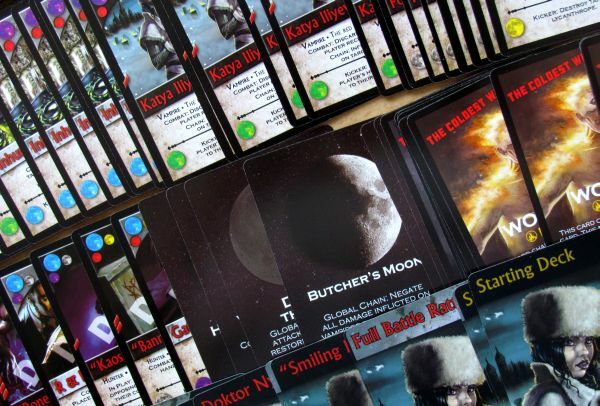 If you are wondering about the remainder of cards, remaining sixty cards represent a starting characters – ten of each of the six available type. 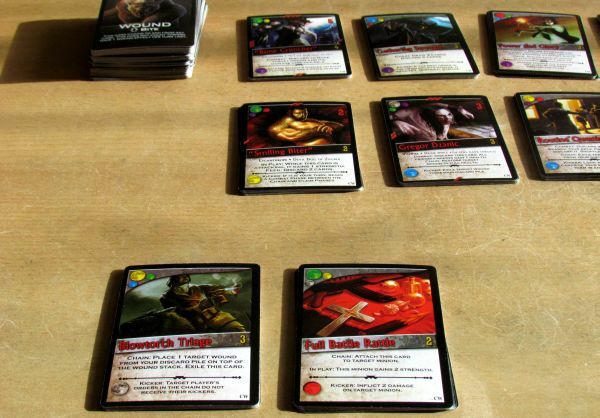 Each player’s hand gets the same starting group, which is typical for deckbuilding games. 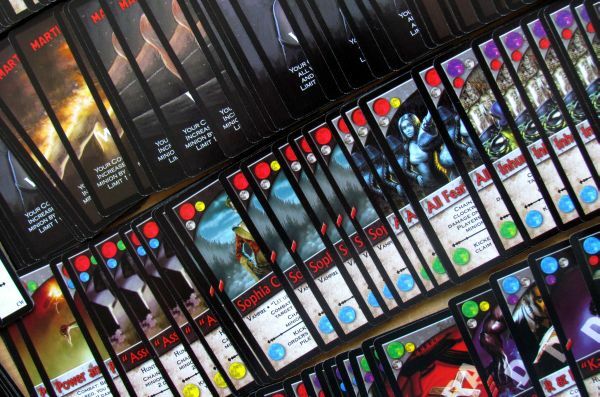 There are also wound cards in the box, and also twenty-four draft cards used for the initial random offer and selection of cards, which will be available in the game. 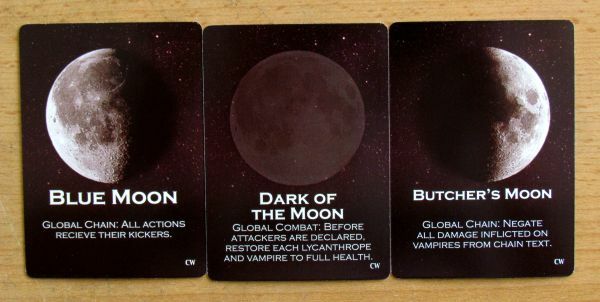 Finally there are six new cards of moon phases. Last 32 pieces differ from the other in dimension and are also a bit thicker in diameter. 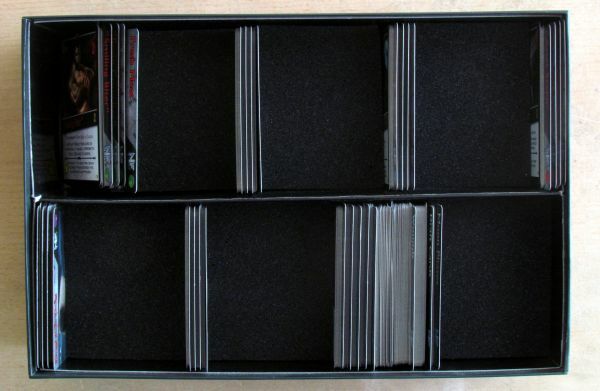 They are binder cards to use for sorting cards inside the box. Like the previous boxes of Nightfall and Thunderstone, also here will you find foam rectangles. They help you to organize cards into two columns, and thanks to oversized binders, you will find everything quickly. Now we should describe differences and innovations, which Coldest War brings. We have already mentioned the moon phases, but that is not all. Among the small news, that will please only owners of the original game, is the set of new would cards. They contain now not only text, but also a nice illustration, different from the original bullethole. That is, why there is so many injuries cards in the game, because you can replace with them ones from the original package and even from Martial Law. 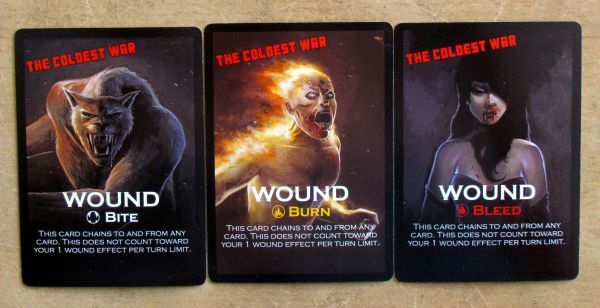 Like the previous expansion, Coldest War brings extra fifteen new wound cards of all three known types, but with new effects. This time, wound cards can speed up the game and improve the possibility of chaining cards. If you have had injuries, you get those cards in your discard pile and later in your hands, just like you know it. With them, you become more dangerous and fiercer opponent, just like a hurt animal is much more desperate.Therefore, you can just use this wound cards as a link between any two other cards in chain. Thanks to this wound, your rivals become feared adversaries! This special treatment of these wounds are mentioned on each card, so you do not have to remember anything. You will find text, that tells you exactly, how this particular injury card can be used in the chain. A distinct advantage for losing players, so they can better return to the game. And this makes Nightfall match even more tense! As we mentioned in the description of the box, players get also starting decks. But you probably never dreamed, that they could be different from the original. But they really are! The entire set of six new cards, which you will have to learn and play. They are easy to recognize once again, thanks to the golden fonts instead of the traditional blood-red. Also this time, each card in starting deck has only one color. So you cannot compile any action chain from these starting cards, you will need to buy another card and add it to your deck. Most of these starting specimens are more advanced, than the cards, which they replace. They even have one or two effects In Play. All six are purely characters, no actions. And according to this, they are more difficult to play and learn with for beginners. An interesting example is JAREK card, which is actually an acronym J.A.R.E.K. – five user names from BoardGameGeek server, who inspired its creation. JAREK knows, how to heal himself at the end of the turn, has attack of one and you do not need to move him to the discard pile as most of disposable characters at end of your turn. Snowstorm is also worth mentioning with its strength increasing with number of defenders on opposing side, or Clever Ivan, which can help you rearrange card in your deck. We have already said, that usage of these cards for beginners can be a bit more complicated and it makes their entry into world of Nightfall a little more challenging. 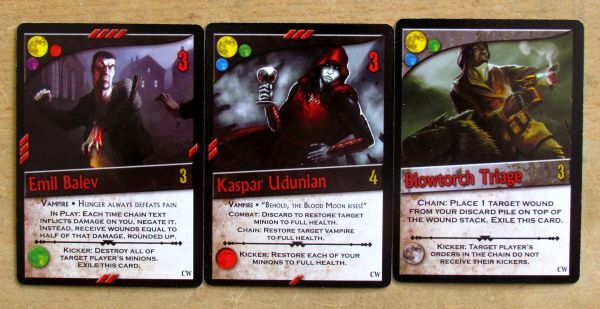 So its not easy to say, if you should buy a Coldest War box as your first in this vampire card game. But at the same time, it also means, that these starting cards are not clear candidates for quick exile (= removing from the game during play), like some of the original ones. Already now, we would not hesitate a second to add Coldest War in our editorial Nightfall collection, but that’s still not all. The seemingly most crucial and, optionally selected, news, is the new six moon phases cards. This package is shuffled and gradually revealed during the game. It affect whole play with events. 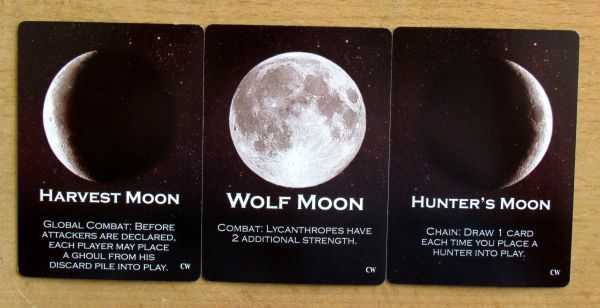 Sometimes moon can shine brightly and increases the power of werewolves, while eclipse favors vampires and wolf people. There’s also a Blue moon, Harvest moon, Bloody moon and Hunters moon. All with their specific effects. All six of their abilities significantly influence the course of the game and brings unexpected effects in it. But luck starts to be a question here. That’s the reason, why these cards are optional addition, and are not required to play it. It depends only on the consent of the players. Here in our newsroom, however, we have had great time with it, because they have an interesting effect on the overall game and make it even more exciting. It makes matter, what creatures will you pick among your ranks and combined with avatars from Dark Rages.. Whooa! And there we could amost end our review today. But there is one subtle change, that you will not notice until playing or reading the cards. Some of them have (besides chain) also new capabilities starting with a keyword Combat. 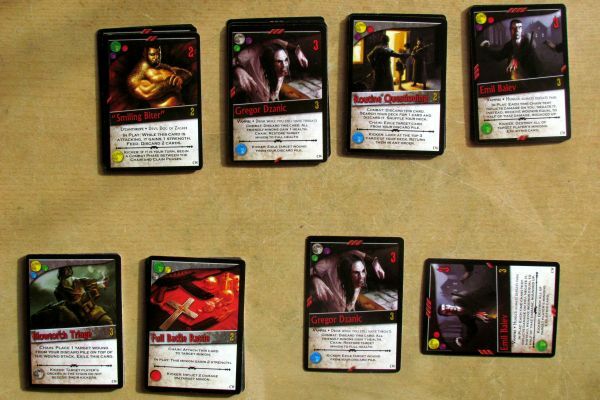 There are a total of twelve of those cards and a list is not limited to the characters or actions. These cards can be used during fight, but to use their abilities, you do not have to play the card as part of the chain. They do immediately, what their text said and you benefit from its appearance right away. This whole concept somewhat undermines elegant chaining ide, that we love so much about Nightfall. They will help you add a servant on the table, heal up your minions or cause immediate injury to one of your opponent’s subjects. They do not make any bloody interventions, most actions have attack value of one. This hurting could work only in combination with a well thought out regular attack. To some, this new direction will not be the best. But it cannot be avoided easy this time. 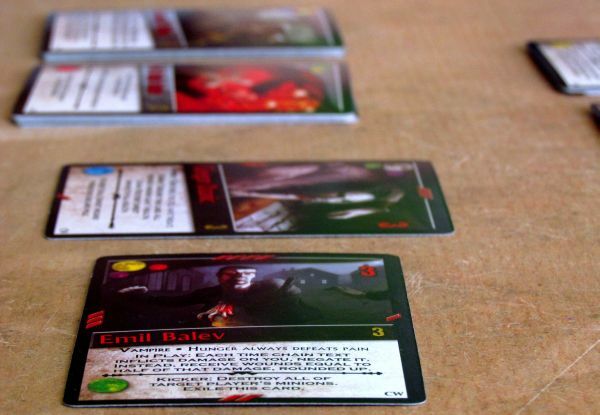 Stille there are two ways – either not play combat the effect of those cards, which makes them quite weak or not to include a card in a game. Just like with the moon phase, we consider this change as interesting and certainly do not think, that would be wrong choice from designer. 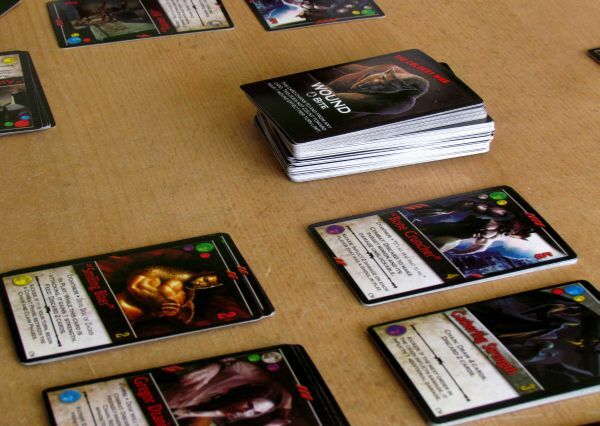 It just gives players even more ways to use cards from their hand and also more options, how to prepare the game itself centered around some mechanics. 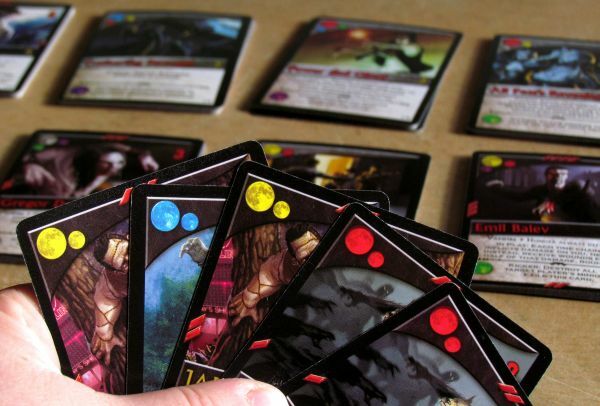 The only drawback is their strength – you can play them basically every time you take them in your hand. Color combination of the moon does not matter. Otherwise, you would have to think through making a chain, which brings tough decisions. These immediate actions simply played, no matter what. Maybe a little houseruling here could help, if you are worried. 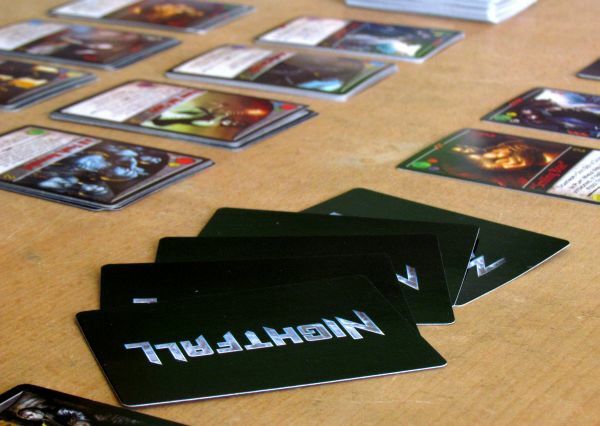 Articles about expansions have a different structure, than the usual presentation of new games. All that is left for this review, is to highlight some cards. Full Battle Rattle for example can be attached to some character you control, who immediately obtains two strength. An interesting card is also All Fears Revealed, which allows all players to attack someone servants immediately, except yours. It is also clear, that this card will probably not be much of an enjoyment in a two player game. Which is battlefield, where otherwise Nightfall excels. 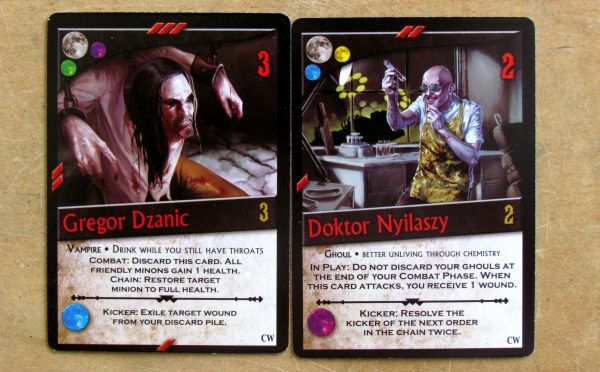 As a last, we will mention Doctor Nyilaszy, who will keep your ghouls in the game for more than rounds, which is great! The overall graphics and tuning Coldest War to a new environment is a very nice change. Cards elegantly, gracefully and quietly follow this shift and new illustrations really add another dimension to the game. The actual images are of an excellent standard and have no fluctuating value. When viewing them, you will not find any card, you would not like. 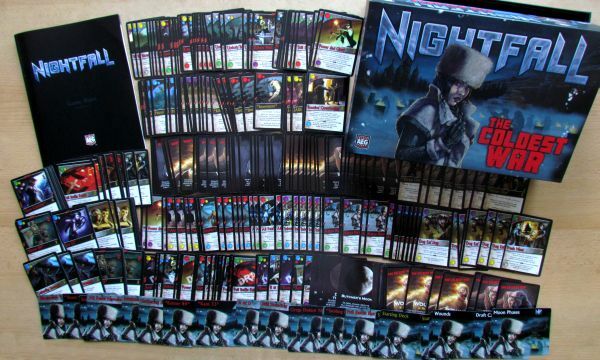 Nightfall: Coldest War is a superb large expansion to an excellent game. It enhances existing wound decks from previous large Nightfall boxes, while adding new ways to play the whole game. And even if you are not captivated by these changes, they will be still there, waiting for the right moment and group of players. Whether it is immediate action or moon phases, they will find fans for sure. Nightfall: Coldest War should have its room in collection of anyone, who loves vampires and Eastern Europe . 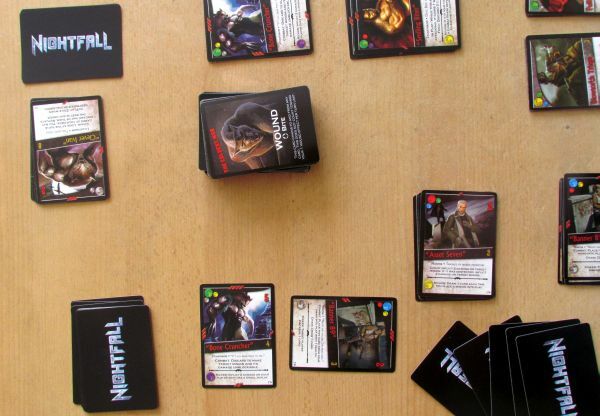 Nightfall: Coldest War is second big expansion for this vampire card game. It brings many new stuff and not only for game mechanics, but also for previous boxes. 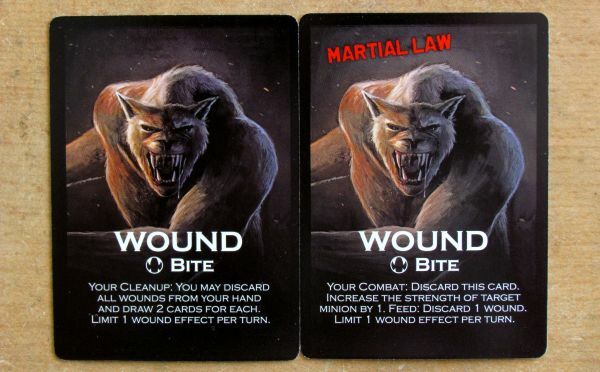 You will find wound card replacements for both Martial Law and basic game, with new and nicely thematic illustrations on them. On top of these, you will get also new wound cards, which work as a joker in card chaining. Wounded players are now even more dangerous, just like a hurted animal. It seems, that moon phases are the biggest new in this box. You reveal one per turn and affects characters of some race in the game. They deepen race specializaton along with Dark Rages. Moon phases are shuffled and bring a little luck, but they are optional. Nightfall match with Coldest War expansion will be different even from the first moment, because box contains also new starting characters for all players. You will have to get used to them and their strength, they are welcome addition and are more powerful, than the old ones. It means, that its not only advertised 24 new card species in the box, but more. These new starting decks are little more advanced and are not designated for beginners with this game. On many cards can you also discover new keyword "combat", which stands for immediate play effect. So you do not have to add this card to a chain to use it and this is, why these card look really powerful - you can use them everytime, when you get them. And they make your efforts to build a balanced chainable deck go in vain. New environment is great for Nightfall. Game brings new rules, which are not for everyone. Yet each of them brings something interesting, if you choose to use it. 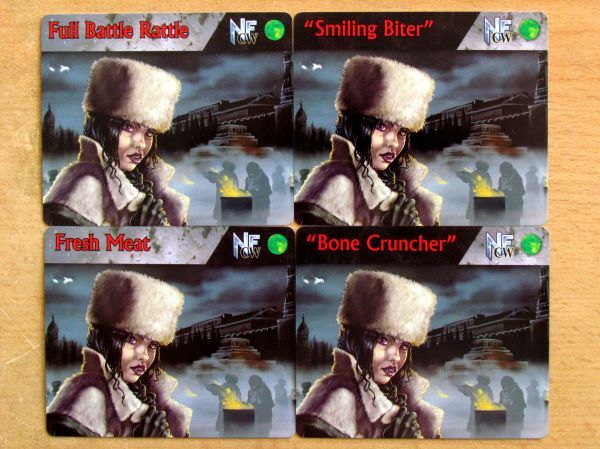 Nightfall: Coldest War is another mandatory expansion, so stick out your neck and get bit!